under supervision of skipper, mate and third hand, receives instruction in all duties on board fishing vessel, with view to qualifying as skipper or mate at conclusion of apprenticeship; assists in handling gear, cooks for men, &c.; as for boy. sets small shore trots with ordinary (pin or blackthorn) hooks on sands for flat fish. acts as cook in trawlers and drifters, and makes himself generally useful; coils warp, mends nets, attends to lights, assists deck hand (q.v.) in handling gear, stowing nets, &c.; is sometimes an apprentice (q.v.). seizes and hauls on short rope lengths (seizings) attached to net when nets are being hauled in; tucks them into net after hauling; casts off seizings when nets are being shot. gathers cockles from sandbanks, using rake, or jumbo, to bring them to surface; or, picks them from sand and rocks, by hand. (ii) (smaller vessels), see third hand. fishes for cod and other big fish with long lines, from any type of vessel; or catches from trawlers, using trawl nets. catches crabs and usually also lobsters, crayfish, &c., in baited crab, &c., pots; sinks pots, with weight attached, on submerged rocks, &c., near to shore, cork buoy attached marking spot; periodically visits by boat, removes catch, re-baits pots with fish offal, &c. , and keeps catch alive; cf., fisherman, lobster; wellman. works in deep sea fishing smacks or steam trawlers of a larger type than those used for inshore fishing; usually at sea several days or weeks; assists in management of boat and in handling nets, lines, &c.; general term covering skipper, second hand, third hand, and/or (leek hand, and boy (q.v.). general terms for men employed in fishing operations in drifters, i.e., boats using nets which drift with the tide and wherein fish are caught by their gills in meshes. catches eels with eel nets or baited baskets; or by spearing, using spear (grange) fastened to line, in turn attached to a pole; or by bobbing or clotting, i.e. line fishing using, instead of hooks, worms threaded on worsted and wound into ball; or by hook and line fishing, hook being ganged, i.e. tied with a winding of wire over knot, to norsels to prevent eel biting from line. fishes for salmon or for sea trout in estuaries with special nets called haaf or heave nets, a double net strapped over his shoulders and supported by his outstretched arms; wades out sometimes breast high. catches herrings in moored or, more usually, in sunk drift nets, cf. fisherman, drifter. usually fishes within a few miles of harbour in small vessel (sometimes petrol-driven); uses crab pots, lines, drift nets, trawls, set nets, prawn sets &c.; returns home each day; cf., deep sea fisherman. (South Coast); utilises action of tide to trap fish, usually mackerel, in kettle, keddle or kiddell nets; erects nets at beginning of season; (staked net), drives poles in sea bed and arranges wall of net on them to make a passage leading into circular enclosure (byth) similarly erected, placed at low water mark; (floating net) pegs bottom of net to soil and attaches corks to net headline; collects fish thus trapped at low tide. catches lobsters and usually also crabs, crayfish, &c. in baited lobster, &c., pots or in hoop nets, as for fisherman, crab. a deep sea fisherman (q.v.) fishing in North Sea. (ii) handpicks oysters at low water (especially daring spring tides). gets prawns with hand net among rocks at low water, or with prawn nets or trawl nets from boats. general term for any person fishing in river from bank, by wading, or in boats for mussels, cockles, flounders, shrimps, salmon, trout and freshwater fish. fishes for salmon with nets or lines or by spearing. (ii) fishes between two boats, when seine net is paid out in circular fashion, both ends being hauled in together after enclosing a circular space of water, precise method adopted varying with strength of current; assists in paying-out and gathering net and in clearing it of fish. catches smelts in seine nets or cast nets in or near estuaries. catches sprats in stow nets or in drift nets from fishing boats, cf. fisherman, drifter, or in seine nets, cf. fisherman, seine, or (more rarely) with sprat trawls from smacks. catches whitebait in stow nets or seine nets. see deck hand; see also second hand and third hand. is second in command on drifters, trawlers, etc., responsible for "seizings", i.e., ropes connecting net with warp; when boat is engaged in line fishing, is responsible for storage and icing of fish; see second hand. transplants mussels from crowded areas to areas more favourable to their growth. gathers mussels either by dredge or rake (in deep water); or by rake or by hand (between tide marks); sometimes also "lays" mussels, i.e., places undersized mussels on mussel bags to grow. hauls in ropes attached to drift net; part of duties of deck hand (q.v.). stows nets in net room, first laying flat and then folding them into convenient sized heaps in regular order and position, assisted by boy (q.v. ); normally part of duties of deck hand (q.v. ), but may be done by any member of crew, cf., third hand, second hand. owns fishing boats and receives fixed proportion of takings; sometimes acts as skipper or superintends sale of produce; engages crew, e.g. mate, third hand, deck hand, boy, (skipper if necessary) (q.v.) to suit vessels; exceptionally agrees to take apprentice (q.v.). cultivates oysters by laying them in suitable localities, clearing ground, providing culch (broken oyster shells, rock, &c.) to which spat (oyster spawn) can attach itself, and eradicating star-fish, or other enemies by dredging; usually employs oyster dredgers (q.v.). goes out in boat (rowing, sailing or motor) and lets down one, two or three dredges to dredge up oysters from water from three feet to twenty fathoms in depth; replaces oysters below size to mature; removes from net for use large oysters; also removes star-fish, whelks, &c., cf. oyster culturist. North-West coast; a shrimper (q.v.) who catches shrimps with push net in shallow water. assists skipper in navigating fishing vessel in and out of harbour; is responsible for upkeep of gear and stores, and for stowage, icing and landing of fish; see mate (term second hand is more usual on sailing boats; mate, on steam trawlers). North-West Coast of England; see fisherman, prawn. uses shrimp trawl from boat (rowing, sailing or motor) or pulled by horse and cart; or uses push net in shallow water, or fixed net. navigates vessel in and out of harbour, selects fishing grounds, shoots gear, directs hauling operations, and is generally responsible to owner. general term for man or boy employed on "smack," i.e., large fishing trawler. is an additional hand carried to help in dealing with large catches on long voyages; also assists as fireman. (ii) (smaller vessels) deck hand; gives general assistance on deck and in shooting, pulling-in nets, stowing and mending nets, &c., as directed by second hand (q.v.) on vessels not carrying deck hand as distinct from third hand. 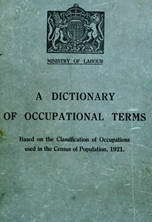 general term for man or boy employed on trawler. Wash district; a shrimper (q.v ) who catches shrimps with trawl dropped from boat or pulled by horse and cart. is employed on fishing vessel containing well in which fish are kept alive; replenishes water in well and, where return to shore is delayed, e.g. North Sea fishing, feeds fish with fish offal; cf. deck hand; fisherman, crab. fishes for salmon or for sea trout in estuaries, with special drift net which catches fish by gills; net is shot and hauled in from open boat. lays and collects whelk pots in suitable rough ground; or (at certain ports) lays off-shore lines having snoods or norsels but not hooks attached; or pegs- down on shore similar lines (shore-trots); or dredges as for oyster dredger. gathers periwinkles left on sand or rocks when tide has gone out. term used, particularly at Great Yarmouth, for boy (q.v.) or for young man between the stages of boy and of deck hand (q.v. ).